It may be hard to believe that these techniques will actually make a difference. Every tissue in the body is capable of remodeling. It just takes a little know-how! The controversy about whether facial massage is effective is refuted by a body of research resulting in “Davis’ Law”. Let’s start at a skin cell and stimulate it with either movement due to activities of daily living or the manual techniques we’ve been discussing. 1 of 4 things will happen. 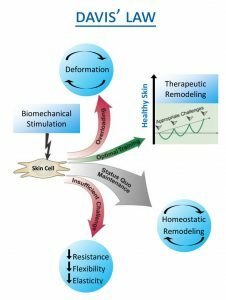 Decreased skin resistance, flexibility & elasticity from a sendentary lifestyle and/or not performing these techniques at all. Status quo, or homeostatic remodeling due to not challenging the cells to remodel. For example, not doing the techniques every day. Therapeutic remodeling. This is the sweet spot where we challenge our skin just enough to achieve healthy remodeling. Here is where real and lasting improvement in your skin’s architecture happens. Deformation of skin. This happens because the techniques are done with too much force. It just takes a gentle approach to stimulate skin remodeling. Long story short, tissue does respond to what you teach it. This may all sound complicated, but in actuality, the techniques themselves are super simple. However, they are NOT haphazard. Please refer to previous posts (part 1) and (part 2) in this series so you can see the structures you are targeting and learn more techniques. When you understand what you are doing, your efforts are empowered with specificity. My guess is, if you are reading this, you are already applying your best anti aging cream, which is stimulating your skin cells simply with your touch and rubbing. My hope in sharing skincare from a physical therapists perspective will help you to maximize these moments so you can hit the sweet spot that results in therapeutic improvement (aka, real and lasting improvement in your skin’s architecture).